NMGMM on the set of Disney's Stargirl! A big thank you to Kaaren Ochoa, Julia Hart, Jim Powers, Amanda Luce, and the cast and crew of Disney’s Stargirl for welcoming our NMGMM Mentees to the set! They learned so much and really enjoyed being a part of the crew. NMGMM Is honored to be the recipient of the 2018 Sage Award from New Mexico Women in Film. Please join us at the NMWIF Holiday Celebration - invitation below with the link to RSVP. NMGMM visits Santa Fe's Capital High with Communities in Schools! A big thank you to Heather Sellers of Communities in Schools and the young women of Capital High for inviting us to speak at their Girls Club. Looking forward to working with CIS and Capital to bring more of our NMGMM programs to their school. NMGMM holds its first PA Training Workshop in ABQ, hosted by PAPA! We are thrilled to report that the NMGMM Production Assistant Training workshop in ABQ in October was a success. Young women from six schools were trained to be “set ready” and gain entry level job experience in the film industry. These girls hit it out of the ballpark with their storyboards and creativity. The next day, the NMGMM Mentees got to put what they learned to the test on set of the New Mexico Women in Film Public Service Announcement set for Enlace Comunitario. They worked as PAs in various departments including Camera, Sound, and Assistant Director. A big thanks to Su Hudson of Public Academy for the Performing Arts (PAPA) and her wonderful students for hosting us and to Cat Jones, writer/director of the PSA, and New Mexico Women in Film for giving the young women a great on set opportunity! Please stay tuned here on our website for upcoming PA training workshops! We are thrilled to welcome you to our new website, going live just in time for our 2018-2019 season. We can't believe that NMGMM is beginning its third year! 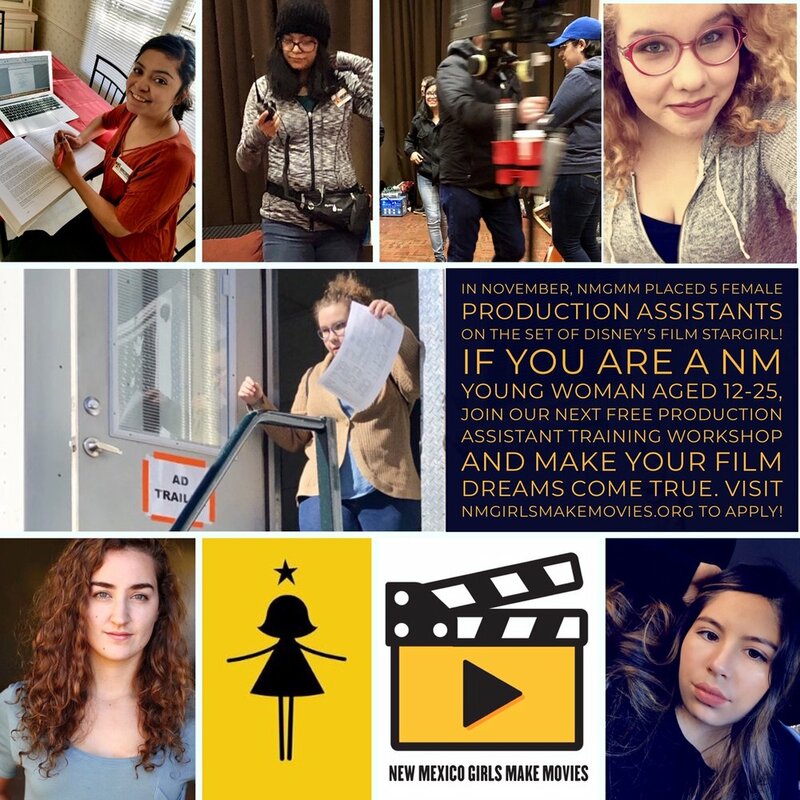 We promise to continue to offer lots of opportunities for young women in New Mexico - film workshops, job training, and internships to name a few. As always, all of our programs are free and open to young women ages 12-25. Stay tuned here for upcoming workshops and events and feel free to reach out with questions or for more info. We love to hear from you!